The 2018 PyeongChang Olympics were my fourth Olympic Games hosting an Olympics party for watching the Opening Ceremonies. I have previously hosted gatherings for the 2012 London Games, 2014 Sochi Games, and 2016 Rio Games. I really enjoyed the Opening Ceremonies this year, and think they were way better than both Sochi and Rio. 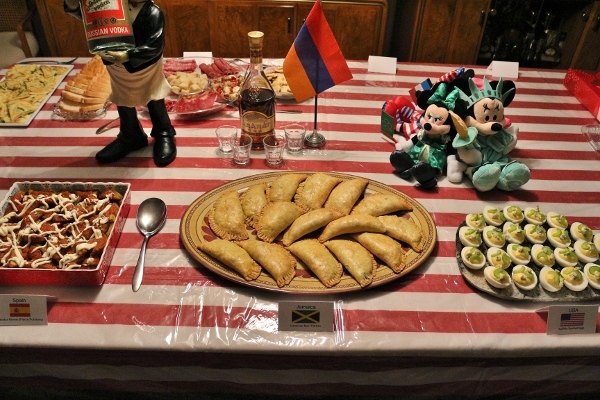 I always make sure to represent the host nation, and today I will be sharing that recipe, but before we get there let's take a look at the rest of the menu, and all the fun decorations! 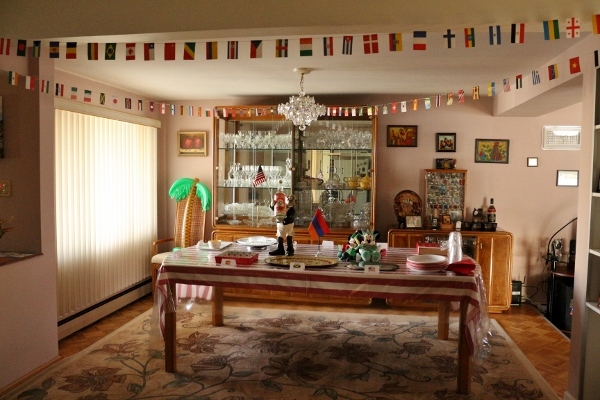 I recycled a lot of what I used at the previous party, including the flags streaming across the dining room, the international Minnie Mouse plush dolls from my personal collection, and some other flags and adornments. We also had some fun outfits representing different countries. 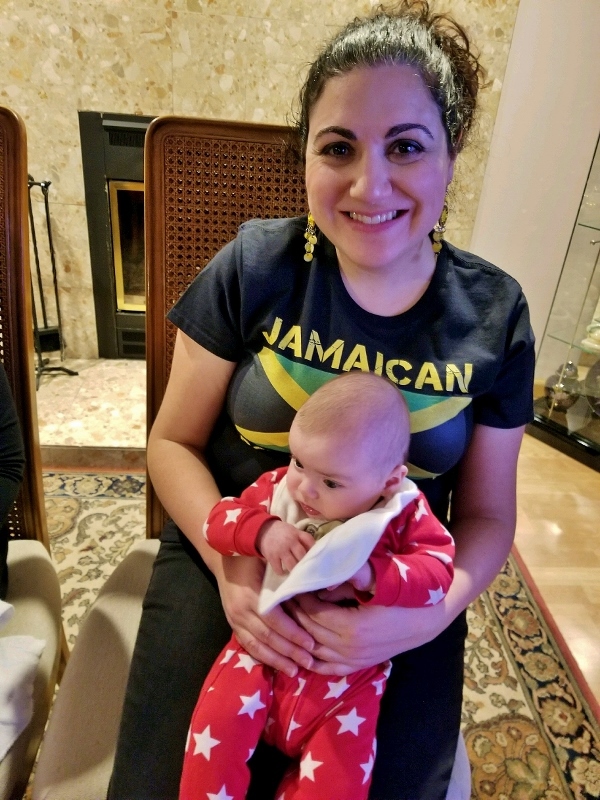 I decided to represent the Jamaican bobsled team myself, inflatable palm tree and all, while my friend Camille's two young daughters both donned patriotic gear supporting Team USA. 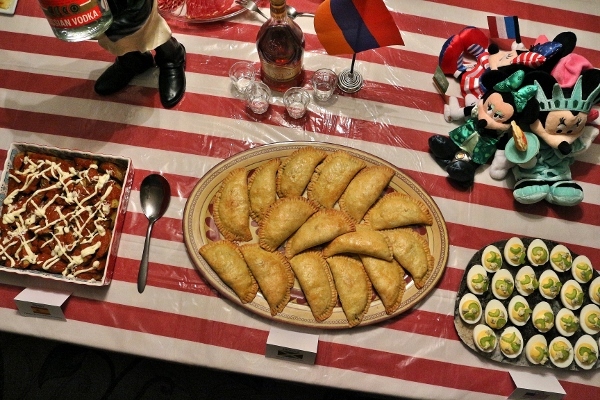 I made the first four of the eight dishes on the menu, and the others were contributed by guests. 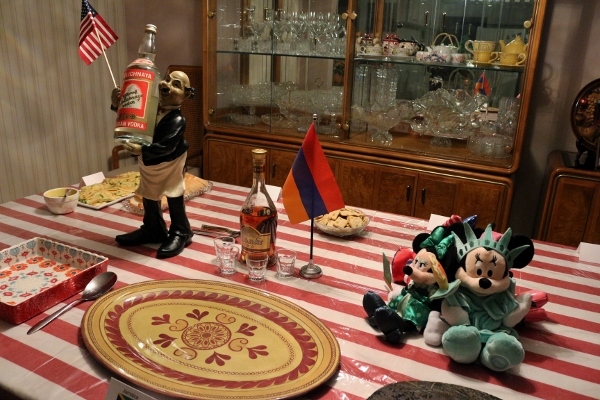 Unofficially, we also had some Belgian chocolates for dessert, Armenian brandy, Australian wines, and Canadian ginger ale (Canada Dry). Let's take a closer look at all the dishes! 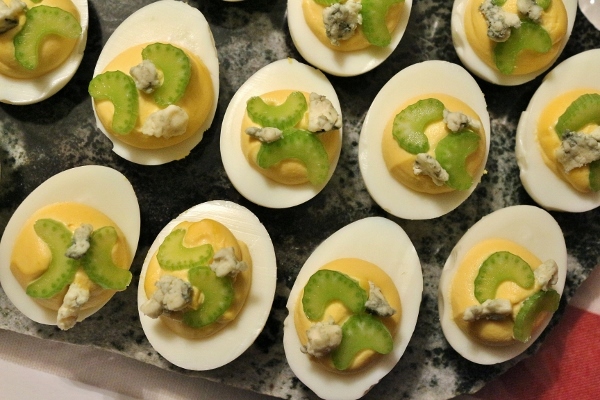 I've made these Buffalo Deviled Eggs before, and they are such a crowd pleaser. 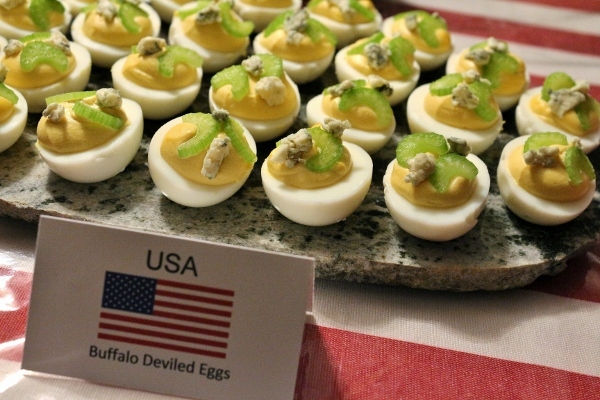 If you like deviled eggs and Buffalo chicken, these eggs are for you! 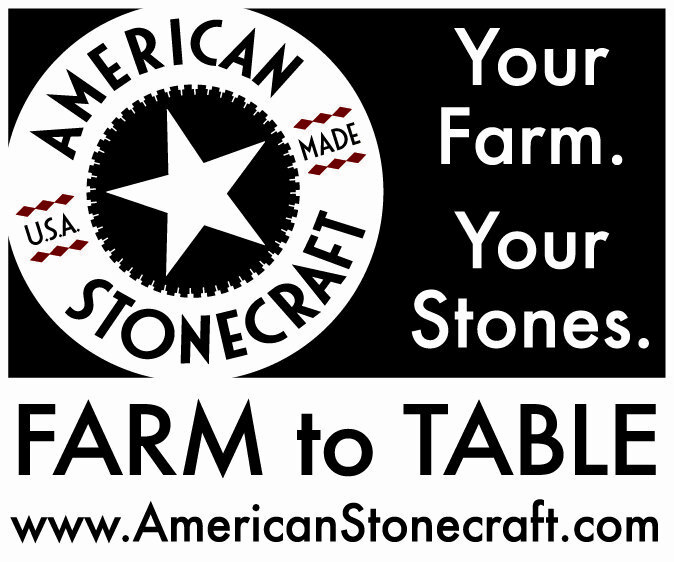 I served them atop my stone slab from American Stonecraft, one of my favorite serving pieces. It was the perfect size for my two dozen egg halves. 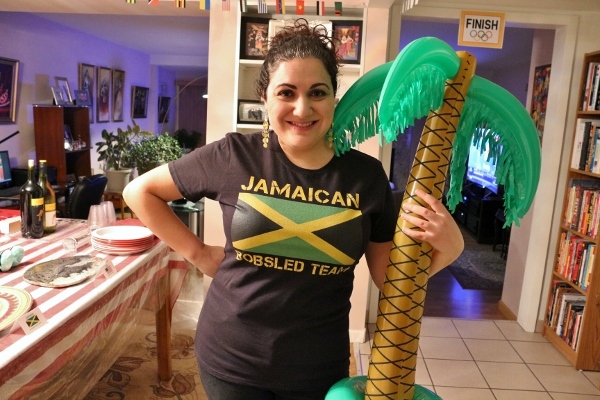 I'm a huge fan of Cool Runnings, and I'm always cheering on the Jamaican bobsled team at every Winter Olympic Games, so I definitely wanted to represent Jamaica on the menu. 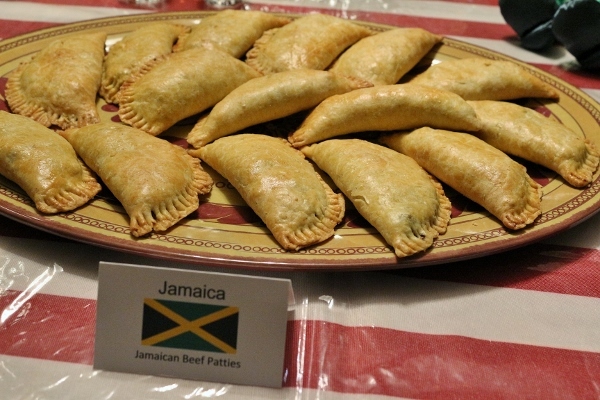 I'll be sharing the recipe for these Jamaican Beef Patties in my next post. 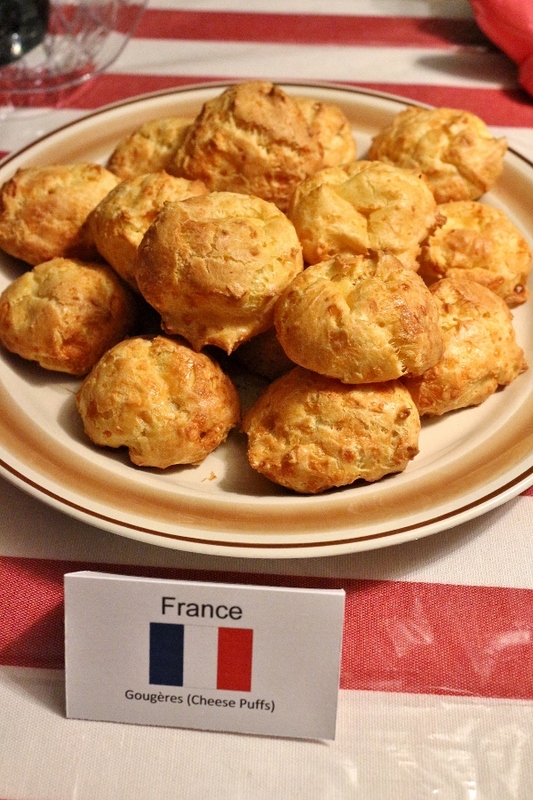 They feature flaky, curry-infused pie dough filled with a not-too-spicy beef mixture. Camille's two year old daughter couldn't stop eating these! 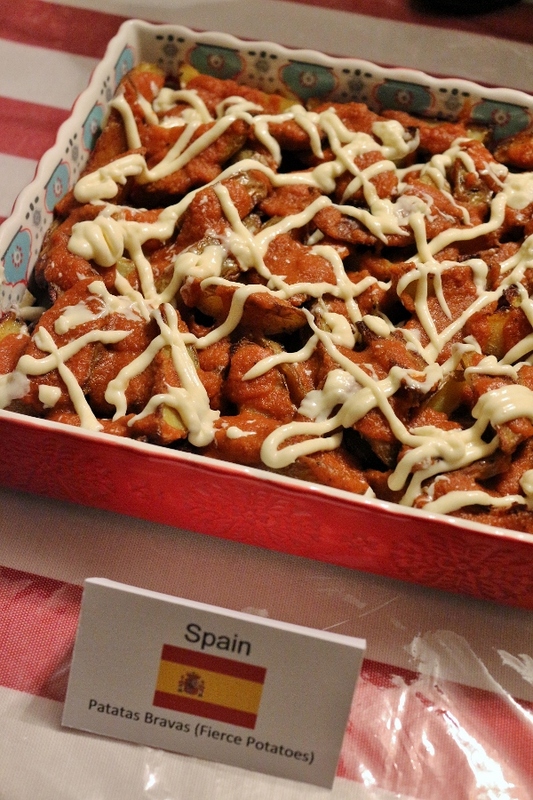 For Spain I made one of my favorite tapas dishes, Patatas Bravas or Fierce Potatoes. 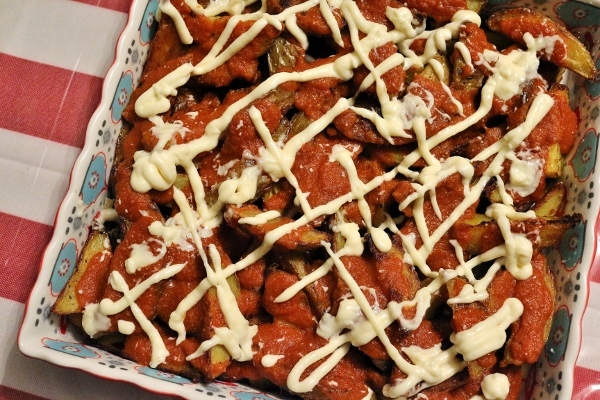 The version I make uses roasted potatoes as opposed to fried potatoes, and is topped with the two traditional sauces, a smokey, tomato-based bravas sauce, and a garlicky allioli. 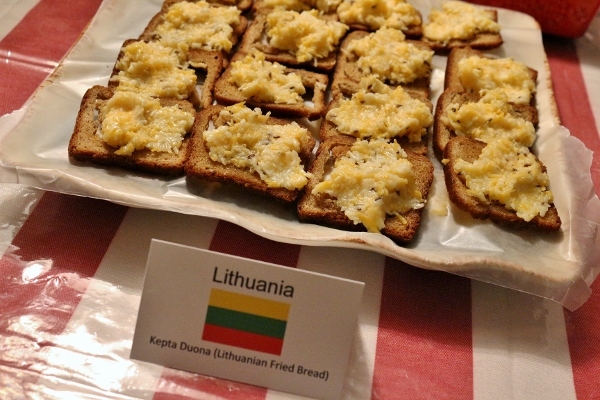 From Lithuania we had an adapted version of Kepta Duona, or Lithuanian Fried Bread. 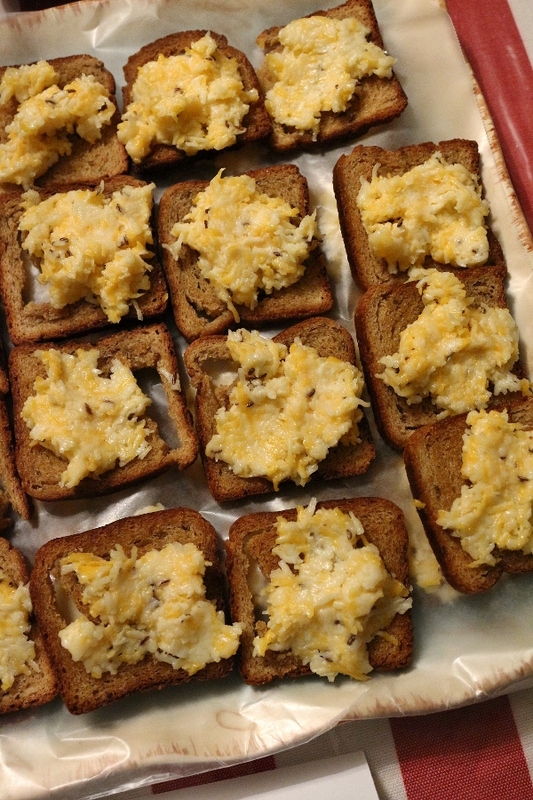 These babies were baked instead of fried, rubbed with tons of garlic, and topped with a cheesy mixture to finish them off. Delicious! 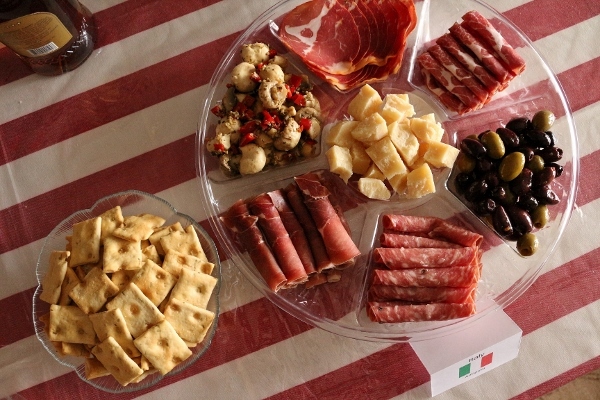 Italy featured a classic Antipasti platter with olives, marinated mushrooms, prosciutto, sopressata, capicola, Parmigano-Reggiano, rosemary crackers, and Italian bread. 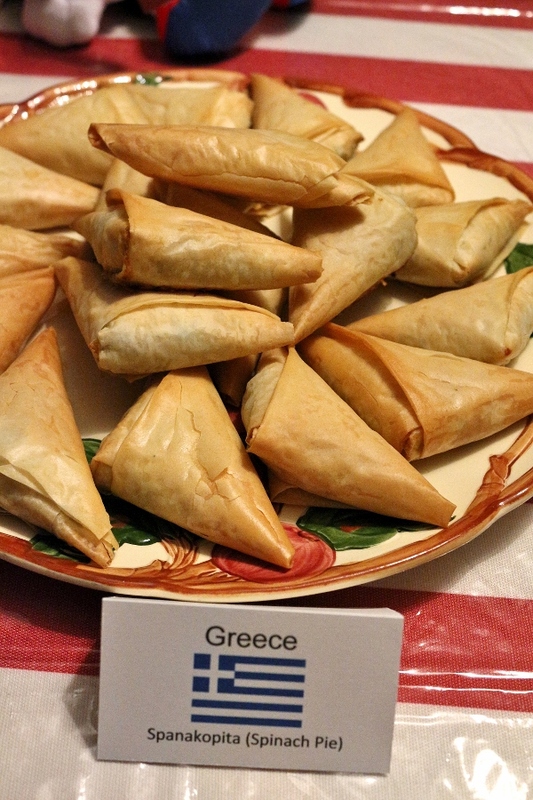 Greece, the country the started it all, was represented with flaky triangles of Spanakopita, or spinach pies. 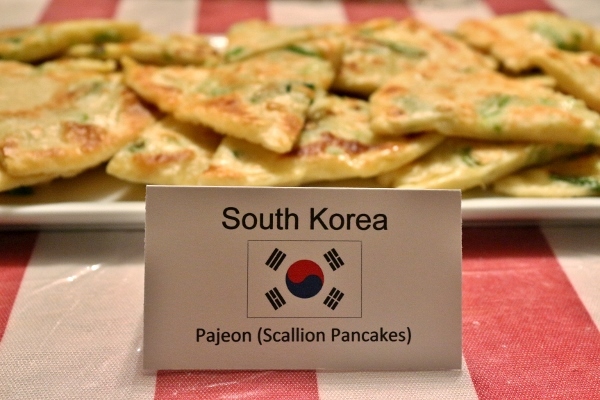 Finally, let's take a look at the host nation's contribution, Pajeon or Korean scallion pancakes. 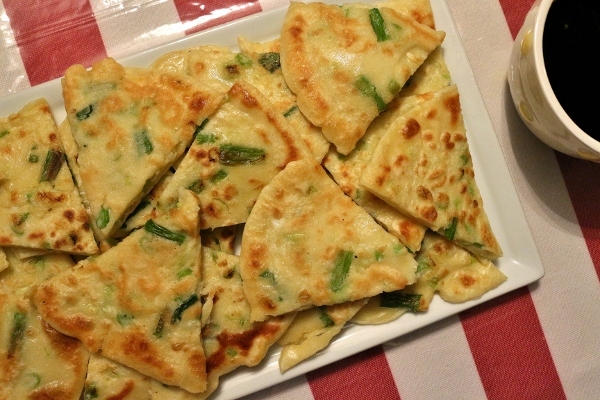 These are very different from Chinese scallion pancakes, which are made with a dough, and are much crispier and chewier. The Korean version is made with a pancake batter, slightly thinner than the American version. 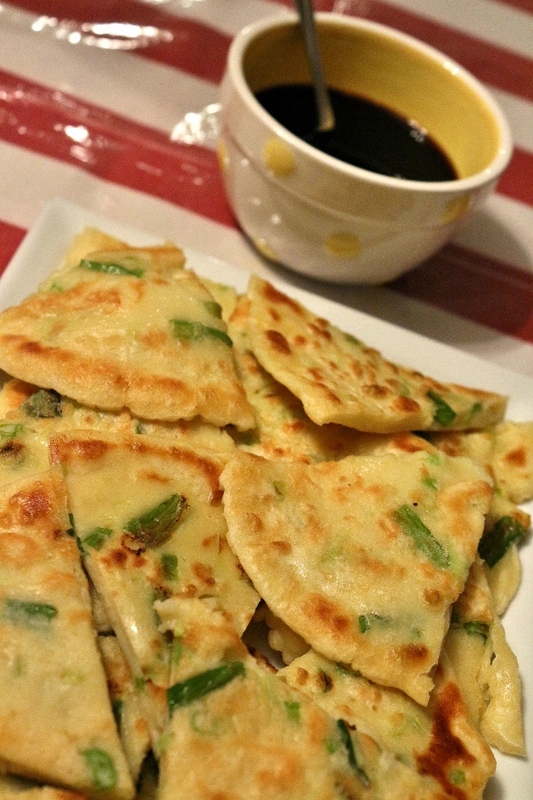 It's more tender than the Chinese version, but just as delicious and chock-full of scallions. Served with a simple soy dipping sauce, these are an easy way to celebrate the host country without shopping for difficult-to-find ingredients or stepping too far outside of your comfort zone. If you can make Sunday morning pancakes, you can make these. 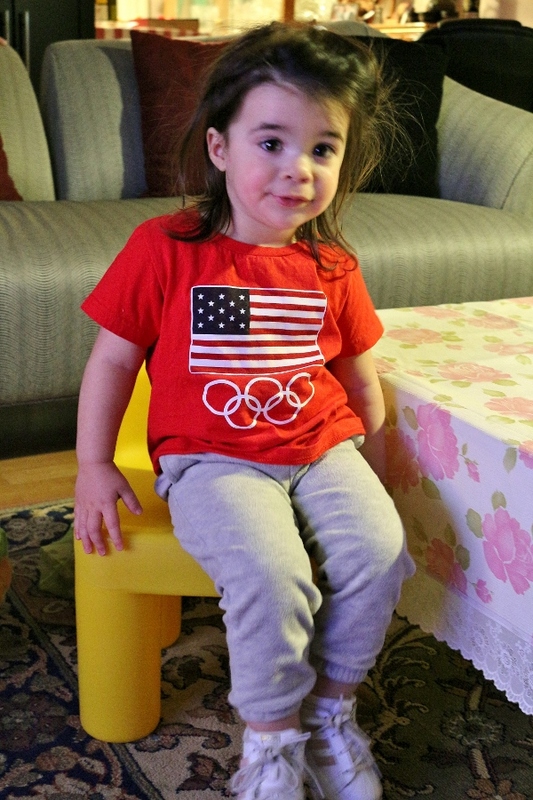 As always, the Olympic Party was a blast and a huge success. 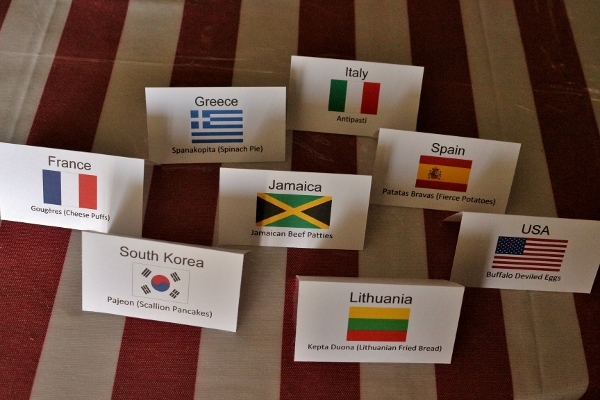 All of the guests enjoyed the varied international menu, even those under the age of two. I'm really excited for all the upcoming Olympic coverage these couple of weeks. Stay tuned for my next post sharing the Jamaican Beef Patties recipe! Combine all the ingredients except for the oil until well combined. The mixture should be a little thinner than American pancake batter. Thin it out with a little more water if needed (or add more flour if it's too thin). Heat a thin coating of oil in a medium non-stick skillet over medium-high heat. When the pan is hot, pour in about 3/4 cup of the batter, or enough to make a thin pancake, about 7 to 8 inches in diameter (you can also make smaller or larger pancakes depending on your preference and pan size). Cook on one side until the bottom is golden, and then flip over the pancake and cook on the other side until it is golden as well. You may need to add a little more oil to make sure the pan isn't too dry. When the pancake is cooked through, and golden brown on both sides, remove to a paper towel-lined tray to blot some of the oil. Repeat with the remaining batter. 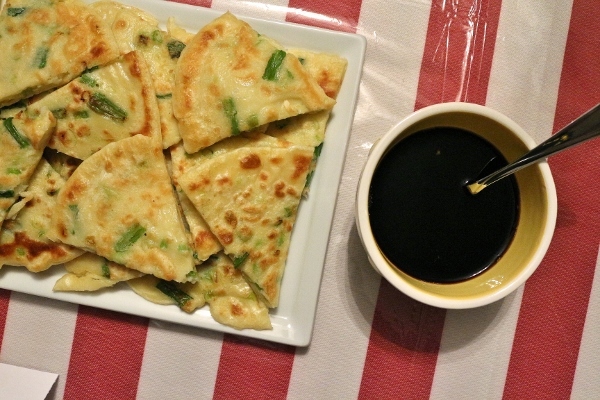 Cut the pancakes into wedges or rectangular pieces, and serve with soy dipping sauce.